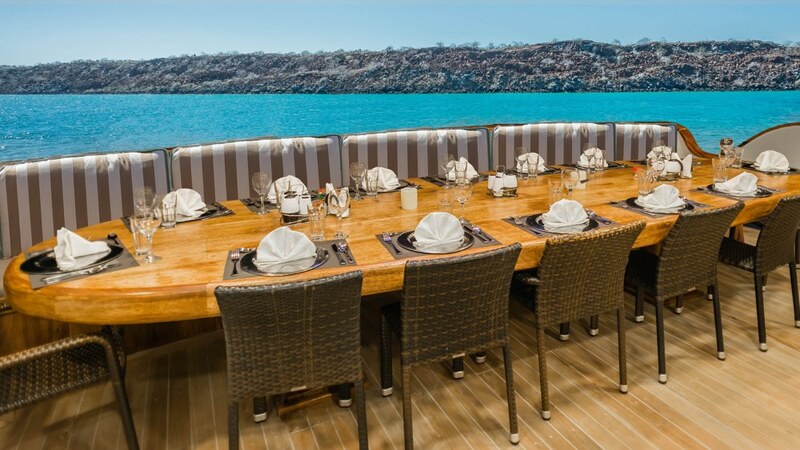 The Sea Star Journey Galapagos Cruise is a top-rate luxury boutique yacht that combines contemporary design, luxury, privacy and comfort. 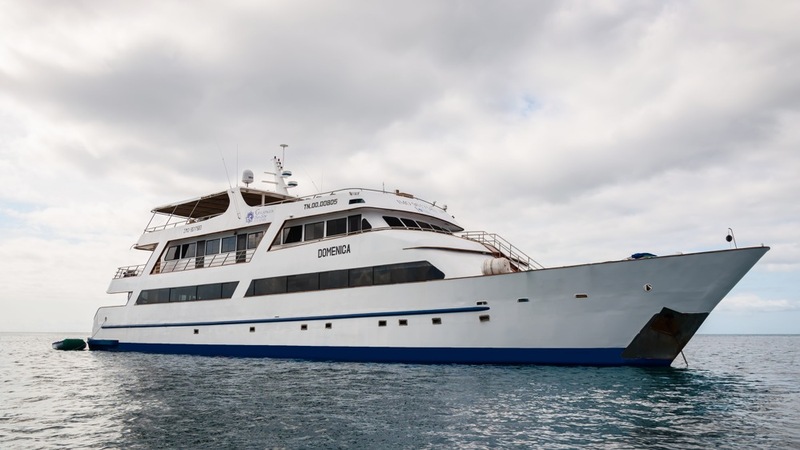 With capacity for up to 16 passengers, the Sea Star Journey is an intimate option for visiting the Galapagos Islands in style. Read our full review. 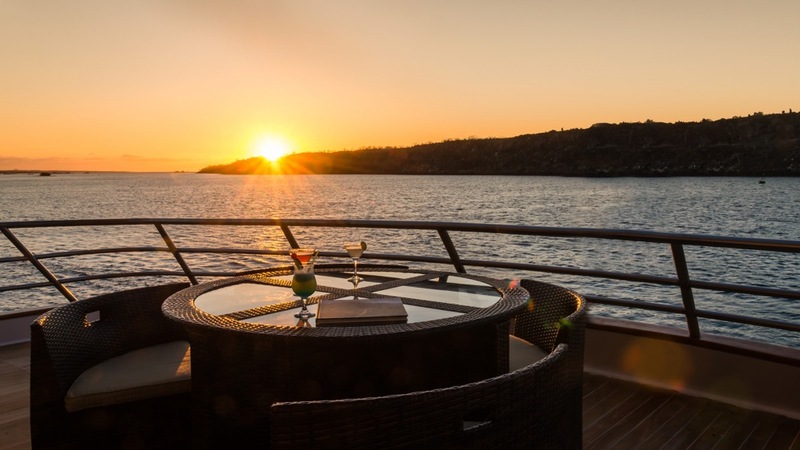 The luxury style of the Sea Star Journey is fresh and modern. Cabins are bright and light, with splashes of yellow adding a decorative touch. The vessel has three deckes: Main, Upper and Sun Deck, with rooms located on the Main and Upper decks. 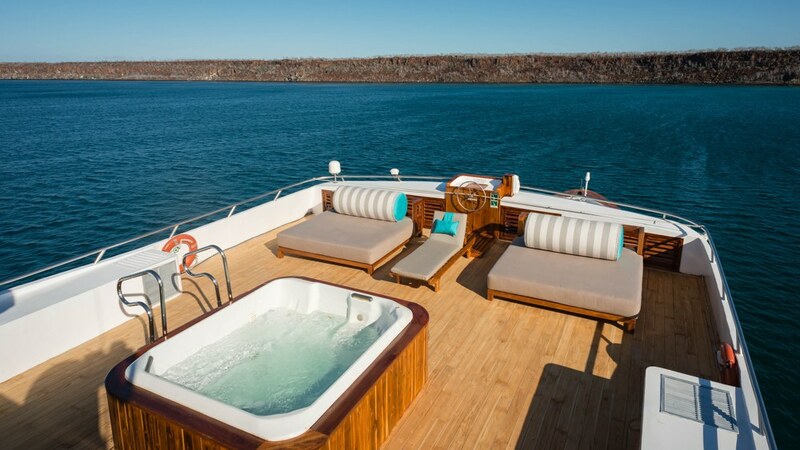 The Sea Stay Journey features one Sea Star Suite and seven spacious Galapagos Suites. The Sea Star Suite is the largest room, with a king bed and large sitting area with a desk. It has windows, but does not have a private balcony. 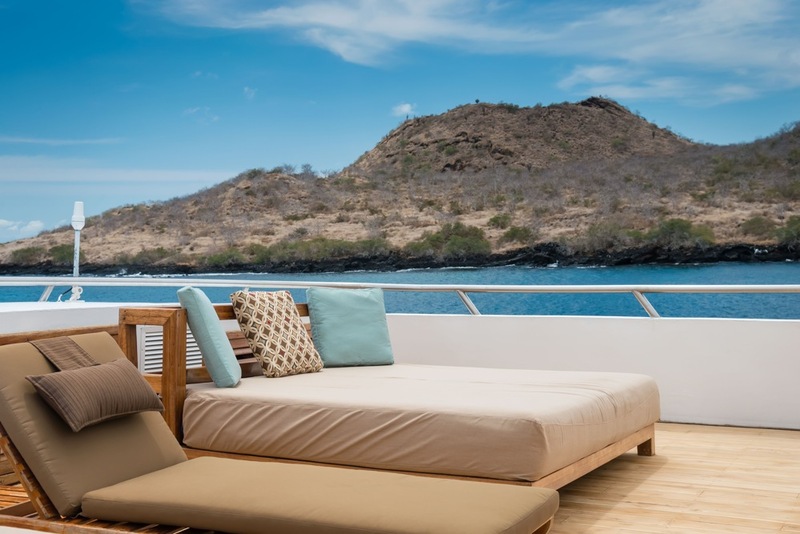 Of the seven Galapagos Suites, four of these are on the Main Deck with small private balconies, while three are located on the Upper Deck (without balconies). 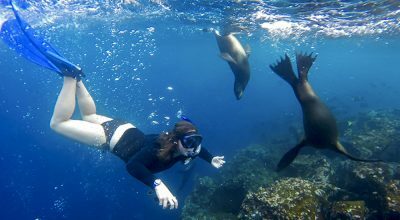 The Galapagos Suites are configured either as double rooms or twin rooms. All rooms have air conditioning, a minibar, and a TV. Twin beds and connecting suites are available for families. The Sea Star Journey was refurbished in 2017. 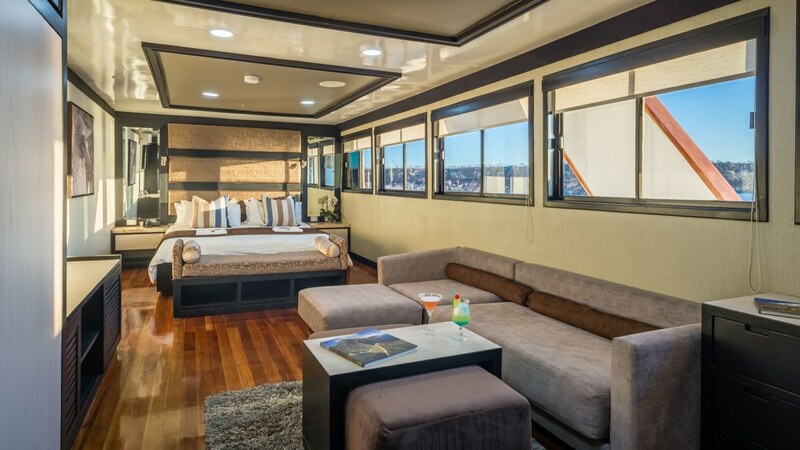 The vessel is equipped with a large solarium on the top sun deck, with sun loungers for sunbathing or resting in the shade. There are two jacuzzis – ideal for dipping into when you come back on board after snorkeling in cool waters. Further social areas include a lounge, mini-library, video library and dining room. 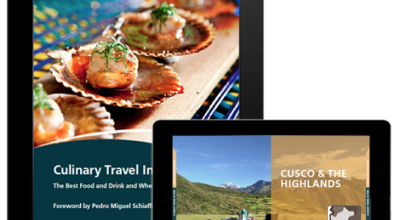 The chef rustles up local and international cuisine, served indoors or al fresco. Private dining options are available. There’s also an outdoor BBQ on the sun deck. 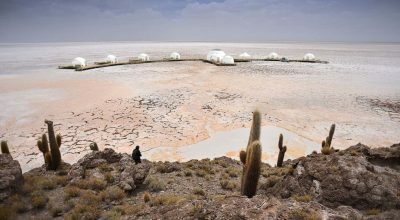 There are a range of itineraries offered by the Sea Star Journey – shorter itineraries can be combined together to create longer itineraries. 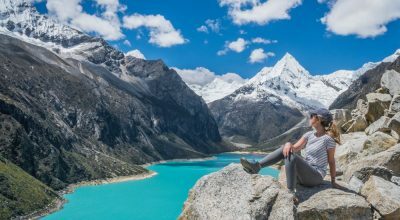 The boat is equipped with a glass-bottom boat for spotting marine life, otherwise you can snorkel or kayak in one of the eight twin sea kayaks.